Green Chile Pork Stew is a hearty meal with roots in Mexican cuisine and the regional food of Sante Fe, New Mexico. 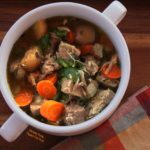 It's a great stew to make 1-2 days in advance, since the flavors marry and deepen as the stew sits. Dry the pork with paper towels and season generously with salt and pepper. Set a heavy-bottomed pot over medium-high heat and add the oil. When the oil is hot, add ¼ of the pork cubes. Brown on all sides, then remove to a bowl and add the next small batch of meat cubes. Repeat until all meat cubes have been browned, adding more oil as necessary. Reduce the heat to medium and add the onion and garlic. Sauté until the vegetables are slightly translucent and beginning to soften, about 5 minutes. Turn the heat to high and add the cumin seeds. Stir for 1 minute. Add 1 cup of the beef broth, scraping to loosen the browned bits on the bottom of the pot. Add the browned pork, onion and broth mixture, remaining broth, water, salt and pepper, and bay leaves to the crock of a slow-cooker. Cover and set on low for 7 hours. Prep and cook the carrots, potatoes, and yuca, either steaming or parboiling until easily pierced with a paring knife (or see work-ahead in the notes). Add to the slow-cooker along with the roasted peppers and Mexican oregano. Turn slow-cooker to high for 15-30 minutes, or until the vegetables are soft. Check seasoning, adding salt and pepper as needed. Serve. *You can substitute 1-2 small cans of roasted green chiles. **Yuca root has a fibrous cord at the very center that can be tough to eat (see this nice prepping tutorial at Food52). Be sure to remove it. Work-ahead: you can roast and peel the peppers, steam the potatoes, carrots, and yuca, and prepare the stew through step 4 one day in advance. Store the meat, onion, garlic, and broth in a container in the refrigerator. Store the roasted peppers and steamed/parboiled vegetables in a separate, airtight container in the refrigerator.